I wish to thank the Benjamin H. Josephson, MD Fund for support of my recent medical trip to Pinares, Honduras. I feel it was a very successful trip. I departed Washington, DC on Wednesday, November 5th and returned Wednesday, November 12. In between I had many wonderful experiences. You will not find Pinares on your map of Honduras. To the North American eye it looks more like a truck stop than a village. Electric power lines run through the area, but only two local buildings have electricity. The two-room schoolhouse is not included among them. Water supplies are tenuous. Some people have cisterns for collecting rain water during the rainy season. A few communities have wells. Others take water from rivers and streams. The economy is agrarian, most people have small farm plots with beans and corn. Those who are able raise chickens and cattle on their plots. Many people earn cash, typically US$2 per day, working for larger farmers or traveling 40 minutes by bus to the nearest town, La Esperanza. A typical day consisted of a two hour hike to a small village school, four hours working with from 20 to 90 local children, and a two hour hike back to our base in Pinares. While in the field we checked children's height, weight, upper arm circumference, vision, teeth and a brief screening physical exam. 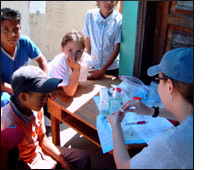 We provided deworming treatment, vitamin A supplements, fluoride teeth varnish, and brief medical attention as indicated. When not traveling to the more isolated villages, I helped to staff the Pinares medical clinic. I was accompanied by 3 other US doctors and by 8 US medical students. Many patients caught my attention. Among them was Henry, an eight year old who initially told me he believed he was a healthy boy. Auscultation of his heart, however, revealed a suspicious murmur in the aortic area. With further questioning I learned that Henry was unable to play soccer or keep up with the other boys running among the hills. Through contributions from our brigade members we were able to procure an evaluation with an echocardiogram for him in the city. The news is not good for Henry though, he has a stenosis of his aortic valve. He needs surgery to survive into adulthood. We are now looking into the possibility of arranging surgery in the US. There are many more vignettes. Some, like Henry, are medically dramatic; most are mundane. All were educational for me.